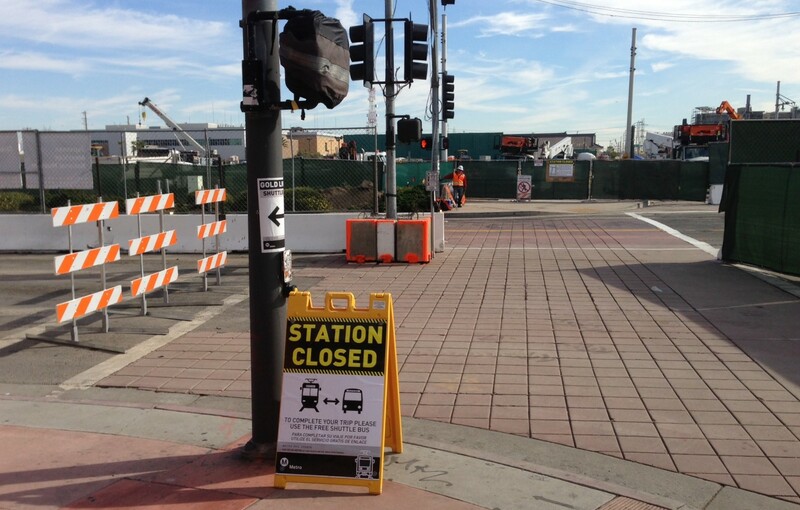 Regional Connector construction Little Tokyo station and road closures are in effect today. View west on First Street at Vignes Street. Westbound First Street is closed between Vignes and Central Avenue. 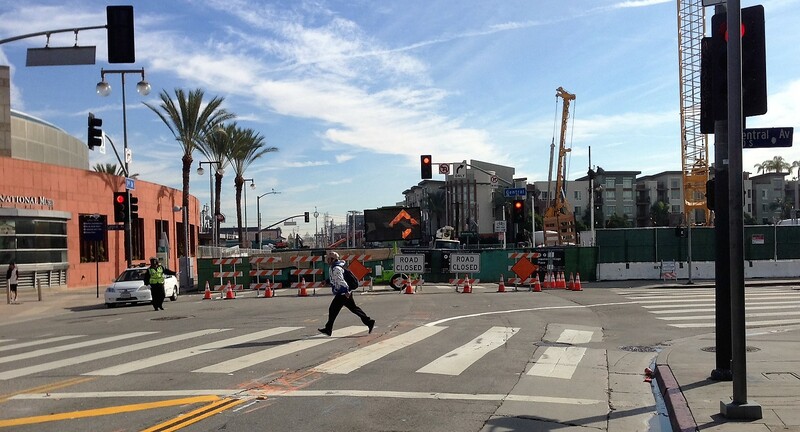 Photos by Joe Linton/Streetsblog L.A.
Last Friday, Metro began its slightly-delayed closure of the Little Tokyo Gold Line Station. 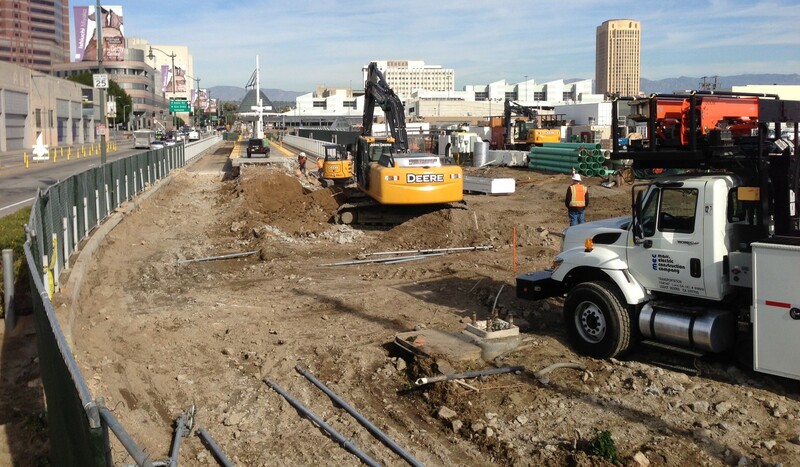 The station will be closed for about three months while Gold Line tracks are relocated to make way for Regional Connector subway construction. If this construction goes reasonably well, the on time within-budget Regional Connector will open in 2021. View north from First Street at Alameda Street. The Little Tokyo Gold Line Station is in the upper left. Tracks south of the station have been removed. 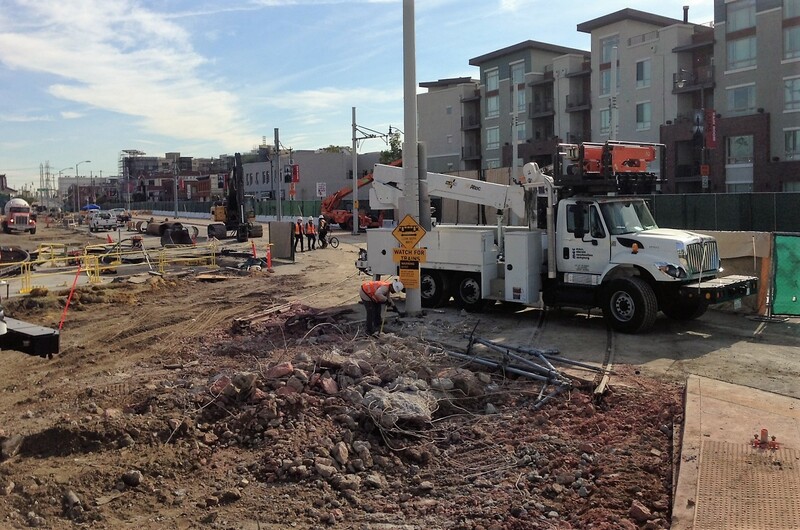 Metro’s contractors (Skanska and Traylor Bros.) wasted no time in getting started demolishing the existing rails immediately south of the station. More of today’s construction photos after the jump. View east from Alameda Street along First Street. The cut tracks are visible in the middle of the photo, under the truck and just behind it. View east across Alameda at First. Southbound Alameda is narrowed to a single lane at First. View east on First Street at Central Avenue. First Street is completely closed for one block the between Central and Alameda, though the northern sidewalk remains open. 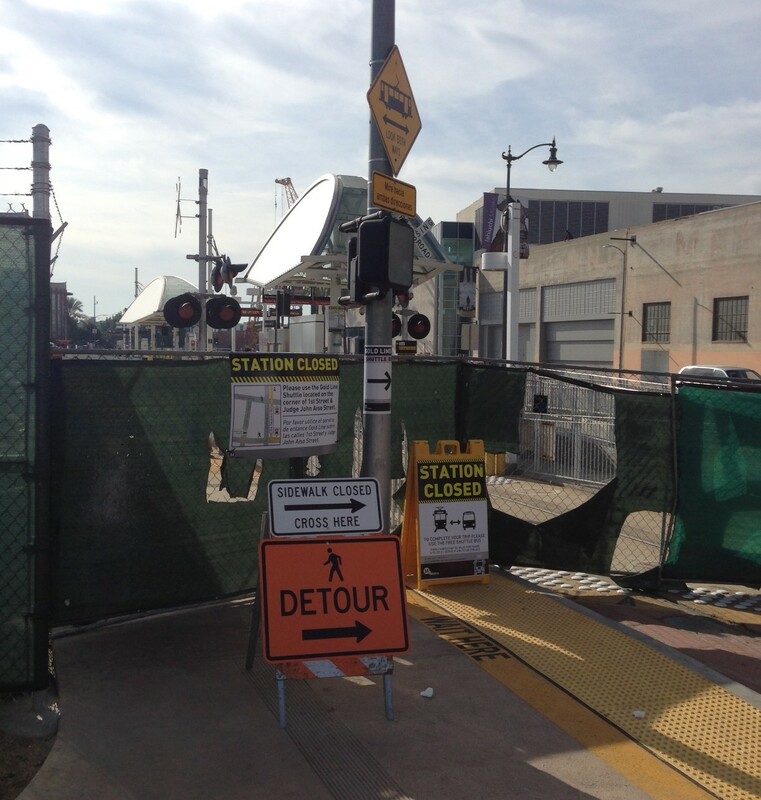 View of north end of temporarily closed Little Tokyo Gold Line Station on Alameda Street at Temple Street. 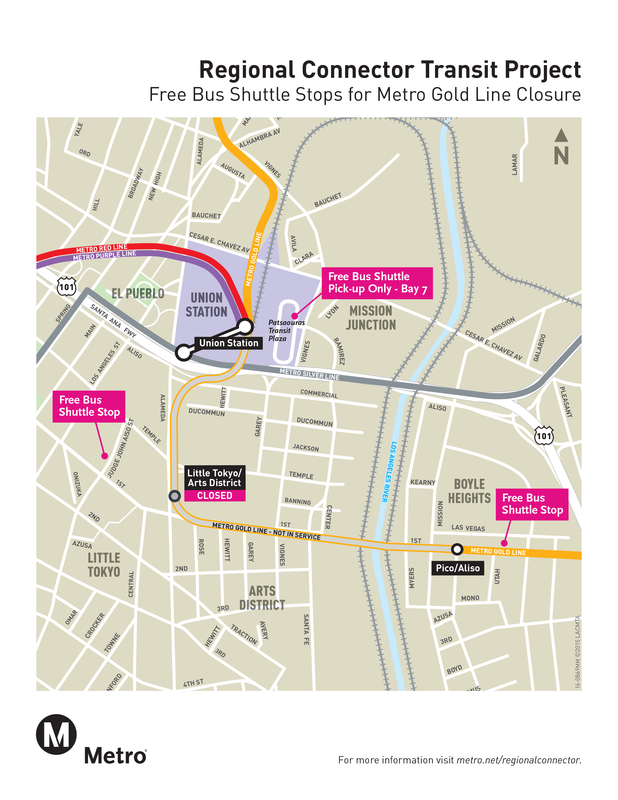 Gold Line service between Union Station and Pico Aliso is temporarily suspended, replaced by shuttle service. Will Metro be running service between Union Station Little Tokyo Boyle Heights on temporary track of some sort, later in the year when this portion of the construction is finished? Or will there just be a forced-transfer to shuttle-bus for that leg of the old route, until the regional connector opens in 2021? Yes – the Gold Line will run on temporary tracks running just north of First Street – while tunnel construction gets underway on (under) First.